Efficient operations and smart maintenance in buildings not only reduce operating costs by 20-50%, but increase occupancy rates and tenant satisfaction. Green Professional Building Skills Training (GPRO) Operations + Maintenance Essentials is a two day course that provides building professionals with strategies to improve efficiency, comfort, and health in our existing buildings. Participants leave with at least three immediately actionable measures and the next steps needed to achieve them. This course is ideal for property managers and building staff in multifamily residential and commercial buildings, including: building superintendents, operators, facility and property managers, operating engineers and stationary engineers. 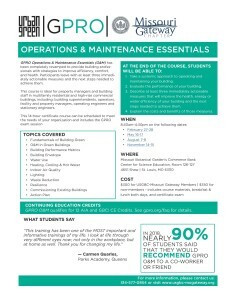 USGBC-MGC is the local delivery partner for this Green Building Professional Skills (GPRO) Training in partnership with Urban Green (NYC Chapter) who developed the training in partnership with the local building trades. Scholarships may be available. Please contact Emily Andrews at 314-577-0854 to inquire. Within the world of green rating systems, LEED provides a model for building-level sustainability, for single-entity controlled community developments, for campuses, and for cities, but it does not have a model for neighborhoods/districts that are undergoing major redevelopment. EcoDistricts is a way for districts and neighborhoods to guide urban development to empower just, sustainable, and resilient neighborhoods. Neighborhoods and cities trying to achieve these goals can follow the EcoDistricts’ “Protocol” to take a collaborative, holistic, neighborhood-scale approach to community design to achieve rigorous, meaningful performance outcomes that matter to people and planet. In addition, EcoDistricts has just released a certification program to recognize those districts that have achieved the goals established through the protocol and an accreditation for people working to create and sustain EcoDistricts. This session will walk through the EcoDistrict Protocol, provide an introduction to the certification process and introduce the accreditation. Cady Scott Seabaugh, Vice President – Communications & Sustainability, McCormack Baron Salazar, Inc.
Cady Seabaugh manages communications across the company and externally with funders, government partners, resident partners and the media. In this role, she oversees public relations, new business development, funding applications, social and new media, and internal communications. In addition, as a LEED Accredited Professional, she assists Project Managers and the Design and Construction team in ensuring that all sustainability goals and performances are met. Architects, engineers and builders have become increasingly effective at designing and delivering high performance buildings. Now if only we had people who were ready to live and work appropriately in these great buildings! It’s not impossible! Leveraging insights from social science you can influence human behaviors and ultimately you can facilitate a culture where saving energy and reducing waste is “just what people like us do.” Join us for a lively discussion and lots of practical examples of how you can inspire changes that ultimately create a new normal. Articulate at least three benefits of inspiring building occupants to adopt sustainable practices. Describe at least three strategies for engaging people and be familiar with examples of each strategy in action. Examine the efficacy of positive reinforcement as an engagement strategy. Identify at least one way to increase engagement in attendees’ own work. Kathy Kuntz is the Executive Director of Cool Choices, a Wisconsin-based nonprofit that inspires individuals, communities and businesses to adopt sustainable practices that reduce greenhouse gas emissions. Cool Choices collaborates with private businesses and public entities to engage employees around sustainability, promoting changes at work and at home via a fun and online platform. Since 2010 Cool Choices has inspired thousands of individuals in hundreds of organizations to adopt more than half a million sustainable practices. Kathy has led Cool Choices since 2010 and has more than two decades of experience with energy efficiency and renewable energy; she previously led Focus on Energy, Wisconsin’s statewide energy efficiency and renewable energy program. This interactive workshop with natural elements will provide a personal inspiration to biophilic design. The presenter will then lead a discussion on the impact of biophilia on three rating standards: LEED V4, WELL and Living Building Challenge. This presentation will explore various projects with compelling connections to Biophilic Design strategies with significant ROI. Participants will leave with practical resources, tools and tips they can use to embrace this newly emerging field. Click here to view a map detailing the location of the WEST entrance to the building. In partnership with IIDA-St. Louis Chapter, Missouri Botanical Garden, BiodiverseCity St. Louis, and Academy of Science-St. Louis. In the built environment, we can use the emerging field of Biophilic Design to create building interiors that connect people to nature; that are connected to their place and mimic the sensory delights of a hike through the woods; that evoke the emotions we feel when immersed in water, that bring nature’s smells, sounds, colors and textures indoors. This presentation will explore clear and compelling case studies of built projects that illustrate Biophilic Design strategies have a significant ROI in interior spaces. Participants will leave with practical resources, tools and tips they can use to embrace this newly emerging field. Tracy highlights the importance of environmental values throughout Teknion and to the company’s clients, both internal and external. She is member of the USGBC, ILFI, ASID, IIDA, International Living Future Institute Ambassador and an accredited professional (AP) with WELL and LEED AP ID+C. She has been selected to serve as WELL Faculty by IWBI for 2018-2019. Her expertise makes her one of the most comprehensive presenters on the topic of sustainability and environmental wellness. She has presented in over 500 venues throughout North America. Tracy currently holds the leadership role for four of Teknion’s key corporate environmental and social responsibility initiatives: Material Health -which through transparency actively promotes the reduction and elimination of harmful chemicals from product; Living Green Educational Series -facilitating and creating content for LEED APs and WELL APs seeking credentialing through CEU programs; Environmental Health and Well-Being- guiding clients through the design process for a healthier and better built environment and CSR Asset Management -turning corporate surplus into community service. In partnership with ASHRAE-St. Louis Chapter. District scale projects and campuses lend themselves well for the goals of complete decarbonization and net zero energy and water. Depending on the project type, context, and location, these goals may also represent the best first and lifecycle cost approach. But getting there will involve navigating everything from utility rates, regulations, and connection fees, metering configurations, integrating electric vehicles, district electric and thermal technologies, managing a phasing plan, and managing ongoing operations. This session will start by reviewing the various definitions of net zero energy and carbon, and Zero Water and One Water, including those developed by the USGBC and ILFI. It will then provide some context in terms of integrating renewables from the built environment into the larger utility mix, addressing duck curves and evolving rate structures. Lastly, it will walk through a step by step process of evaluating district systems, moving towards a decision of onsite technologies and configurations — including financial and incentive analysis, evaluating the potential for onsite storage, and partnering with third party entities where appropriate. It will also include best practices regarding performance management so that the project’s ultimate zero carbon and lowest life cycle cost are realized. This will include reference to 3-4 actual projects around the country in various phases of development. Review definitions and challenges of Net Zero Energy, Water, and Carbon. Examine the role of the built environment in transitioning to a 100% clean energy future. Describe various utility contexts, rate structures and the changes that are taking place in the utility space. Discuss how to approach district energy and water projects from technical and economic perspectives, and the challenges and opportunities unique to these project types. The Sustainable SITES Initiative (SITES) defines what a sustainable site is and elevates the value of landscapes in the built environment. The SITES v2 Rating System is a set of guidelines and performance-based metrics that align land development and management with innovative sustainable design, covering areas such as soil, vegetation, water, materials and human health and well-being. During this seminar, attendees will review local applications of SITES strategies with an emphasis on storm water management. Ted is known around the country for his tacit knowledge of park planning, landscape design, horticulture, environmental planning, and landscape maintenance best practices. His vision and talent is infused in his firm’s practice, ever challenging accepted standards and methodologies. Ted was named ASLA Fellow in 2018 and, in 2012, he was awarded the Robert Goetz Award for this contribution to the profession of landscape architecture. Regional Green Building Challenges and Successes – How Can We Improve? Take on the challenge of crafting an effective case for green building. A panel of design, construction, development and business ownership professionals will kick the evening off with a discussion on national and regional green building progress to date, regional success stories and challenges, as well as opportunities to build momentum. Equipped with this knowledge and their own perspectives, attendees will then break into small groups to role play client/consultant scenarios encompassing a wide variety of project types. Beer, wine, and appetizers will be served during the shortened networking period from 5:30-6 pm. * Note shortened networking period. Presentation portion will begin earlier than usual (at 6 pm). PARKING is available for a small fee in the Stadium East garage immediately south of HOK’s office building. There is also street parking on Market Street next to the Ballpark Hilton and on the Kiener Plaza side as well.